Did you miss the Fall Faculty Institute? For more information regarding mindfulness, visit the following links. The Slow Professor focuses on the individual faculty member and his or her own professional practice. 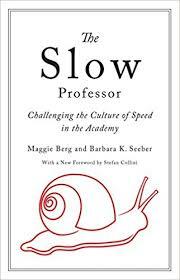 Berg and Seeber present both an analysis of the culture of speed in the academy and ways of alleviating stress while improving teaching, research, and collegiality. All sessions will be held on Monday from 9:00-10:00 in 159 Fitzelle Faculty Lounge. Dates: January 21, January 28, February 4, February 11. Contemplative pedagogy is a way for instructors to empower students to integrate their own experience into the theoretical material they are being taught in order to deepen their understanding, help students to develop sophisticated problem-solving skills, support students’ sense of connection to and compassion for others, and engender inquiries into students' most profound questions. All sessions will be held on Friday from 11:00-12:00 in 159 Fitzelle Faculty Lounge. Dates: January 18, February 1, February 15, February 22. Join by email to facultycenter@oneonta.edu to participate in faculty dialogues and receive a copy of the text.